This plant has an interesting history. 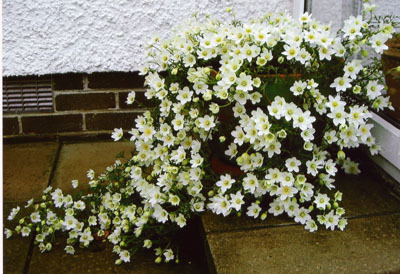 Its parents are Clematis marmoraria (from the ‘marble mountains’ in New Zealand), and C. paniculata (the NZ native puawhananga). It arose in 1983 from a batch of seed sent by Joe Cartmann of Christchurch to Henry and Margaret Taylor, and was named Clematis x cartmanii 'Joe' by them. 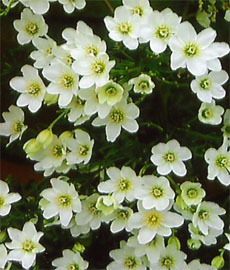 Native New Zealand clematis are dioecious being either male or female. 'Joe' is a male, thus never sets seed and must be propagated vegetatively. Jean & I have been growing this particular plant in this container (earthenware) for at least 10 years. At first we did not prune it and grew it over a wire frame, but now we set it on a step and allow it to tumble down. It remains outdoors over the winter and flowers profusely in March & April. We now prune lightly after flowering and feed it to encourage new growth from the base - these branches then flower the following year. It prefers a sunny position in the shelter of the conservatory.